Six young people who had worked for the Kennedy administration in 1963, but all in minor jobs, receive a death threat 10 years later for reasons they "will fully understand". Why them? They hadn't even known the president. Then one night Congressman Thomas Medwick is killed. His car veers out of control, and the police rule it an accident. But George Williams, one of those named on the list, knows better. As a deputy assistant attorney general for the Justice Department, and its most skilled investigator, he takes the threat seriously, indeed. He had loved the young president, had shared the excitement and mission Kennedy had inspired in America during the '60s; for Jack Kennedy, Williams would have sacrificed anything. But he never thought it would have to include his life. An epic story of the men and women of the Kennedy years. Would you listen to Last Man at Arlington again? Why? 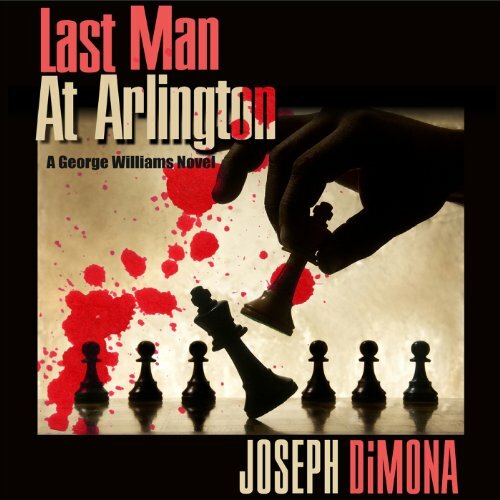 This is an excellent novel, which I'm so glad I listened to.It is a finely crafted and constructed thriller - well plotted and researched - and very engrossing.Last Man at Arlington was written in, and takes place, in the early 70s, with the era almost serving as one of the novel's characters. Initially some of the references to "grass" and "hash" and "draft dodgers" seem a bit archaic 40 years on, but the novel ultimately captures the sense of loss over the death of JFK, mistrust of government in the immediate aftermath of Watergate, animosities stirred by the war in Vietnam, and interdepartmental and political in-fighting in Washington really well.Listening to the novel you can tell that Mr. Dimona knew what it was like to work inside the Beltway and also that he did significant research to make sure technical aspects of the novel were realistic..Point of view bounces from the villain/antihero to the six potential victims, to the hero and back again - with backstories supplemented by Hoover-esque confidential informant files.While I felt the story started a bit slowly, it gathered steam throughout and drew me in until the exciting conclusion.I really enjoyed this book and would have gladly read or listened to any follow up (the hero George Williams could have carried a series), but sadly Mr. Dimona passed away.Last Man at Arlington stands as a fitting tribute to Mr. Dimon's talents as an author. What was one of the most memorable moments of Last Man at Arlington? I really loved a detailed explanation of how the FBI dealt with written evidence, as well as the vivid anecdotes used to provide background for the novel's characters. What about David H. Lawrence XVII’s performance did you like? The narrator, actor and voice actor, David H. Lawrence XV!II did an excellent job narrating this story.While he used his acting skills to provide some fantastic character voices - including a Brooklyn mobster and a spinster aunt - he allows the authors words to tell the story, which is how it should be.